"The question of whether medicines discovered today are safer more efficacious, and more affordable than generic medicines (whose patents have expired) or medicines that are centuries old could be answered "no" for most of the modern medicines. If so then it is logical to revisit and revive these age-old medicines for the welfare of mankind. Curcumin is one such medicine. Its history goes back over 5000 years to the heyday of Ayurveda (which means the science of long life). Turmeric was mentioned in the writings of Marco Polo concerning his 1280 journey to China and India and it was first introduced to Europe in the 13th century by Arab traders". 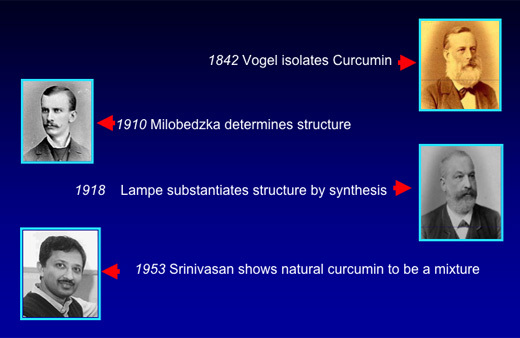 Anyone doubting that there is any real science to support the Curcumin story might be in for a surprise. 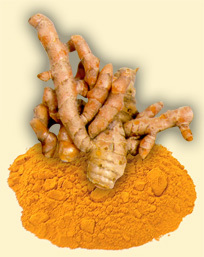 A search of Medline on the internet reveals some 1,800 studies describing the various activities of turmeric/curcumin. According to a 2005 Wall Street Journal article titled "Common Indian Spice Stirs Hope" research activity into curcumin is exploding. In that year there were nearly 300 scientific and technical papers referenced to curcumin on the Pub Med database. What is it about curcumin that has so many scientists excited? 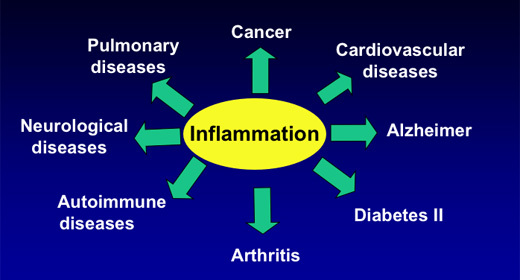 The starting point is inflammation which is known to play a major role in the development of most diseases including: Cardiovascular diseases, Cancer, Pulmonary diseases, Neurological diseases (including Alzheimers), Autoimmune diseases, Arthritis and Diabetes. 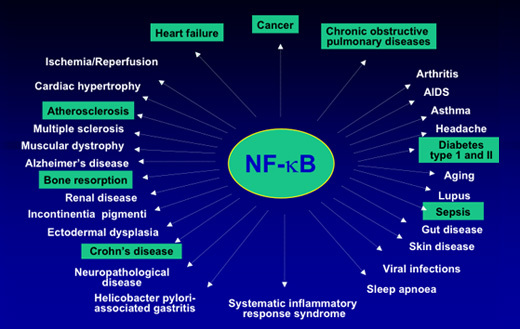 When we talk about inflammation the term NF-kB (nuclear transcription factor kappa beta) comes up and without getting into the complex subject of molecular biology, all we need to understand at this point is that NF-kB has a major role in most diseases and inhibition (blocking) of NF-kB can suppress inflammation. 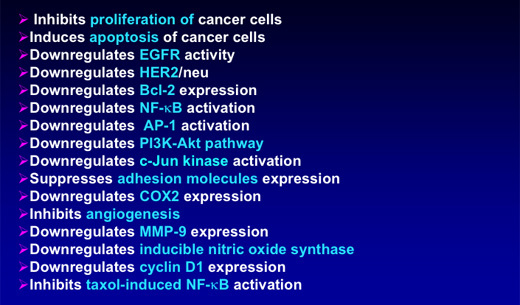 The list of diseases that have been shown to be associated with activation of NF-kB is indeed lengthy and includes all of those listed above and many more. It is more a question of what isn't on the list rather than what is. The next question is, if curcumin is so effective why haven't we been told about it? The answer to this has more to do with money than anything else. In an interview with Reuters, Prof Aggarwal explained that curcumin is a natural compound and no drug company can reap the financial rewards if it proves to be effective. This however hasn't stopped the big players trying to patent it. In the late 90's the U.S. Patent and Trademark Office granted a patent for turmeric to the University of Mississippi. The Indian Council of Scientific and Industrial research was shocked to hear of this and the Indian Government reacted swiftly with an appeal. The patent was then rejected. Curcumin has been shown to be effective against colon cancer where inflammation appears to play a significant role. Curcumin has been found to be a powerful inhibitor of the Human Papilloma Virus (HPV) which is linked with cervical cancer. Data on this was presented at the 24th Annual Convention on HPV and Cervical Cancer in 2005. Researchers at MD Anderson Cancer-University of Texas reported that curcumin could stop the spread of Multiple Myeloma, head and neck cancer, Mantel cell lymphoma, lung cancer, melanoma, pancreatic cancer, prostate cancer, breast cancer and others by triggering apoptosis (programmed cell death). Of significant interest to women is that curcumin appears to have a therapeutic potential for preventing breast cancer metastasis. In the publication 'Phytopharmaceuticals in Cancer Chemoprevention', Prof Aggarwal and colleagues they say that when it comes to HER2 positive breast cancers, curcumin down regulates the activity of Epidermal Growth Factor Receptor and expression of HER2/neu. The researchers say "curcumin depletes cells of HER2/neu protein". If this is true it has huge implications. A study conducted at Dept of Oncology, National Taiwan University Hospital and reported in "Clinical Cancer Research" seems to confirm this. They say "The erbB2/neu gene (also known as HER-2) encodes a 185-kDa protein that has tyrosine kinase activity. The amount of P185neu protein on the cell membrane was drastically reduced after curcumin treatment." It is worth noting that the drug Herceptin was developed to achieve the same outcome. Prof Aggarwal was one of the head cancer researchers at Genentech, the company behind Herceptin. It would be certainly be very interesting to run a laboratory trial comparing Herceptin with curcumin. Other areas of research into curcumin include use of the spice to protect the skin against damage from radiation used to treat cancer. Curcumin may also be used to block estrogen mimicking chemicals e.g. DDT and Dioxin (very important for breast and prostate cancer research). It is a little known fact of epidemiology (study of populations) that Asian Indians have age adjusted Alzheimer's and other senile dementia rates that are only 25% of ours in the developed world. Research is suggesting that curcumin may one day be used to prevent and treat this insidious disease. Its mechanism of action would be preventing the formation of amyloid plaques which are associated with the disease. Then there's arthritis which is an inflammatory condition. Curcumin has shown to be a powerful inhibitor of Cyclooxygenase 2 (Cox -2). This is what Vioxx and Celebrex were developed for but unfortunately that's not all they did. Ulcerative Colitiis which is inflammation of the colon may also be likely to be a candidate for treatment with curcumin. The risk profile for curcumin is encouraging; even at doses up to 12,000 mgs per day there appears to be no- evidence of toxicity. Many will ask if we can we obtain sufficient curcumin just by sprinkling turmeric onto our food? The answer is almost certainly no; turmeric contains only 2-5% curcumin and because it is insoluble in water curcumin is very difficult to absorb. It is therefore necessary to take curcumin as a supplement. Products are now being standardized as high as 95% curcumin. As to how much to take, this is as yet largely undetermined but on the FAQ section of MD Anderson Cancer centre website they talk about working up to a daily dose of up to 8,000 mgs which is around 40 times the amount that might be consumed in the average Indian diet. 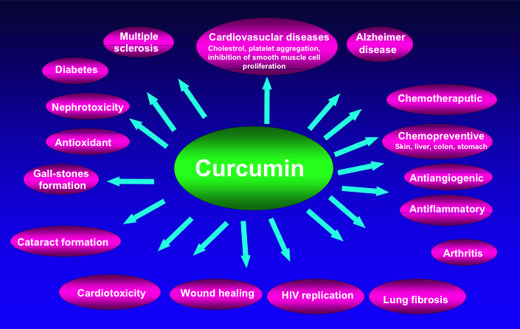 Curcumin should not be seen as a magic bullet for every ill, but given the enormous amount of published data curcumin should not be overlooked by researchers looking into safe and inexpensive options for disease prevention and treatment. © 2007 - 2012 Appleton Associates Ltd. | all rights reserved.